Beautiful textures from silk, velvet and burlap embossed fabrics, powdery blue walls with white stenciling and a surprising dose of black reimagines the Sleeping Alcove in a bold, new way. A seating area at the foot of the bed features an alter table, art, statues and antique clocks the client has collected over the years on her travels. Grasscloth wallpaper keeps the bedroom from becoming too feminine and offers a quiet point of respite. The client wanted a beautiful dressing area without committing to permanent built ins. Each piece moves freely for repositioning or moving to another room entirely. The three drawers under the bench hold 12 pairs of shoes each. The tall cabinet to the left pulls out to reveal a jewelry board on one side, purses on the other. The rug is a favorite of the client's from her time abroad. A former walk-in closet is reborn. 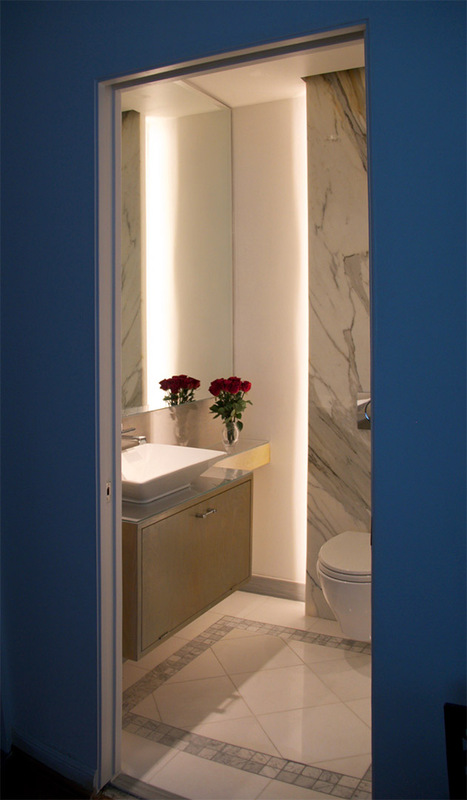 The backlit, Infinity-recessed Calacutta slab takes front and center in this beautifully appointed micro- bathroom. The backlit and ceiling recessed Calacutta slab renders a soft glow and vertical scale that suspends the sensation of width and height. Storage for towels and toiletries, raised off the ground and a purposeful floor detail claims the space rather than fights it. A short but extra deep soaker tub and wall mounted fixtures provide precious real estate that allows for remarkable freedom of movement in such a small space. A transom window was added to the former closet to bring in fresh sunlight without compromising wall space.